State Rep. Tim Ackert proudly represents the 8th General Assembly District, which encompasses Columbia, Coventry, Vernon and part of Tolland. He was re-elected to serve a fifth term in November 2018. Rep. Ackert serves as a member of the Energy and Technology, General Law, and Higher Education and Employment Advancement Committees. Additionally Rep. Ackert serves the House Republican Caucus as an Assistant House Republican Leader and a member of the Bill Screening Committee. Rep. Ackert is a small business owner and an Air Force Veteran. 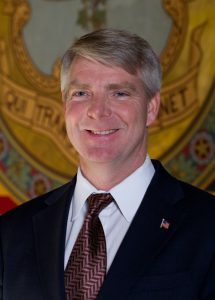 Ackert has a long history of service to his community, participating on the Board of Trustees for Connecticut Community Colleges, Vice-Chairman of the Police Building Committee, American Legion Officer, and President of the Connecticut Jaycees. Throughout his tenure, Rep. Ackert has been recognized by a number of organizations for his work on behalf of his constituents. Ackert received the Children’s Champion Award from the Connecticut Early Childhood Alliance in 2016, 2015, and 2014. The American Association of Retired Personas (AARP) honored Rep. Ackert for his commitment to protecting energy consumers with the 2015 Legislative Achievement Award. He was also presented with the 2015 Advocate for Youth Award from the Connecticut Youth Services Association. He has resided in Coventry with his wife Teddie since 1987.